The Ontario University Division Championships took place this past weekend. The teams in the OUA are split up into two divisions. Competing in the Fairweather Division were the top 5 ranked teams with Toronto, Western, McMaster, Ottawa, and Guelph, and the remaining teams competed in the deBray division including Waterloo, Laurentian, Wilfred Laurier, Brock, Queens, York and Carleton. 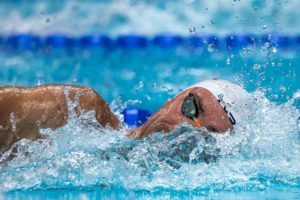 The Fairweather Championships took place at the University of Toronto, with two timed finals sessions taking place on Saturday evening and Sunday afternoon. Both the University of Toronto men and women went wire-to-wire to defend their divisional titles, both topping 1000 points. The Guelph women upset Western to grab 2nd place by a mere 5 points, while the Western men finished 2nd, well ahead of 3rd place McMaster. The highlight from the weekend was Toronto’s Kylie Masse breaking the Canadian record in the 50m backstroke, coming in at 26.84. 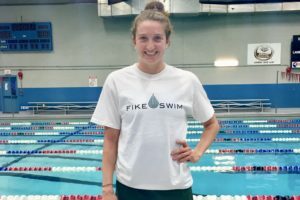 That swim broke the record Paige Miller set just two weeks prior at Age Group International that was also held in Toronto, where she went 27.00 breaking Chantal van Landeghem‘s 2013 record of 27.01. 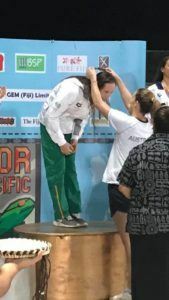 Masse was the top point getter on the women’s side, winning all four of her individual events for a maximum 80 individual points. Along with the 50 back she won the 200 back (2:06.23), 200 IM (2:12.05) and 100 back (58.50). The Toronto women also swept the relays. Paige Schultz also scored the maximum 80 points, with wins in the 50, 100 and 200 free and the 50 fly. Masse posted the top time in the country in all 3 backstroke events, while Schultz posted the top time in the 100 free. The Guelph women managed their 2nd place finish on the strength of 56 and 55 point performances from Emily Anzai and Tara Mallory. The Toronto men dominated, winning of 11 of 16 individual events and all three relays. 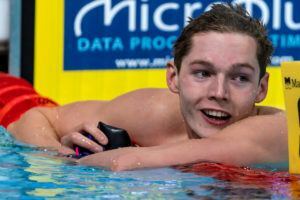 They had strong performances from first year swimmers Osvald Nitski and Cameron Kidd, who brought in 138 points between the two of them. Nitski had two wins in the 1500 free (15:36.74) and 200 fly (2:00.00), and two 2nd place finishes in the 400 IM and 400 free. Kidd posted the top time in the country this year winning the 50 free in 22.16. 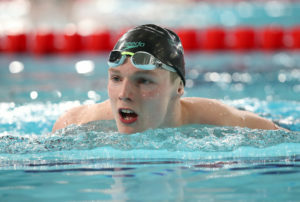 He also had top finishes in the 50 fly (2nd) and 50 breast (5th). Along with Kidd’s top time in the country in the 50 free, 2nd year Kyle Haas posted the top time in Canada in the 50 back in 24.89. Defending CIS 100 and 200 breaststroke champion Eli Wall was the top point getter among the men, with 80 points winning all four of his events. He won the 400 IM (4:20.78), 100 breast (1:01.79), 200 breast (2:12.84), and 50 breast (28.65). The events the Toronto men didn’t claim were won by Guelph and Western. 2015 World Championship team member Evan van Moerkerke won both the 100 (49.06) and 200 freestyle (1:48.74). Guelph’s Eric Trevisan won the 50 fly in 24.64, and Western’s Gamal Assaad and Matthew Loewen won the 100 fly (53.94) and 200 IM (2:03.84) respectively. 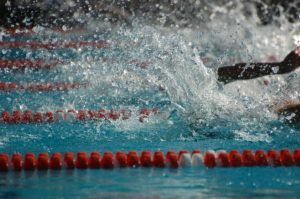 The deBray Championships took place at the same time as the Fairweather Division, with the meet taking place at Brock University in St. Catharines. The team race was similar to last years battle, with the Waterloo men and Laurentian women running away with the team titles, and the battle for the overall score coming down to the wire. Queens University ended up finishing 2nd on the women’s side, edging out 3rd place Waterloo by 60.5 points. On the men’s side, the Laurentian men finished 2nd, with Wilfred Laurier in 3rd place 32.5 points behind. Laurentian edged out Waterloo for the overall score by a mere 18.5 points. Laurentian got big contributions from their entire women’s team, with top point scorers going to Riley Konrad (72) and Léa Paulus (71). Konrad put up wins in the 200 (2:21.37) and 400 IM (5:04.77), and Paulus won the 800 free (9:17.61) and had three 2nd place finishes. The Queen’s women were led by first year swimmer Jenny Zhang, who scored 72 points with wins in the 100 (58.92) and 200 free (2:07.28). Other top female scorers were Josie Andres of Waterloo (73) and Kate Vanderbeek (77). Andres won both the 50 fly and 50 breast, and Vanderbeek swept the backstroke events. Similar to the Laurentian women, the Waterloo men dominated with contributions coming from across the board. Leading the way was Graeme Kemp, who put up 80 points with 4 wins coming in the 400 IM (4:21.35), 200 back (2:00.89), 200 IM (2:03.49) and 400 free (4:03.84). Other top scorers for the Warriors were Aidan Chow (75) and Jonathan Ramkissoon (70). Chow swept the butterfly events and Ramkissoon won the 100 and 200 breaststroke. The Laurentian men were led by Matthew Schouten who put up 77 points, with wins in the 50 (23.08) & 100 free (51.60) and 50 back (26.85). He led off the 200 free relay in 22.89, breaking a 17-year-old school record. 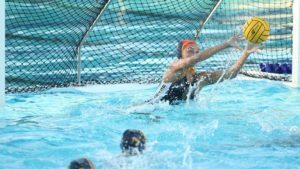 The team went onto win and break an 11-year-old school record. Waterloo won both the 400 free and 200 medley relays with Laurentian in 2nd.